Teddy tells Miranda she needs a job and that the sisters are mad at her and she's pregnant with Owens baby. Miranda tells her she needs to talk to Alex. Catherine chastises Mer for sharing her diagnosis. She and Jackson are doing surgery together. Teddy finds Owen who is sick. He is surprised to see her in scrubs and upset to find out that she plans on working in the hospital. They bicker. Amelia overhears it and something hurtful Owen said and so does Maggie. Teddy has to talk to Maggie about a job despite not liking each other. 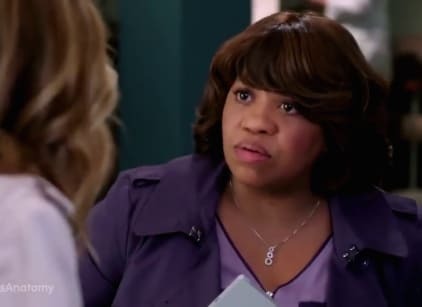 Meredith, Link, and Jo work on their trauma patient who is supposed to be getting married. Owen tries to make it up to Amelia but Tom kicks him out. They need to focus on Catherine's case. There is a flu epidemic in the ER. Maggie and Teddy bicker. Jo reveals why she thought Meredith and Link would be a great match. Maggie worries that Catherine is in too much pain to do the surgery, but Miranda believes she is still Catherine Fox and has an entire team by her side. The surgery doesn't work out and Catherine have it out with Richard and Jackson. Owen is accidentally injected with a paralytic in surgery. He passes out. DeLuca takes over. Jo finds Alex, who says she is glad they are both alive. He has surgery as she thanks him for marrying her. Jo helps Tom and Amelia with their tumor issue. Teddy freaks out about Owen. They talk and he gives her his job and takes Aprils. He tells Amelia he wants her and only her. Link offers to help Mer with little Bailey'sparty. He shows up and helps and they bond. Tom sits with Teddy and feeds her his fries.